Paula Mary Jean Gilpin, age 62, widow of Ronald B. Gilpin, passed away Wednesday, December 19, 2018, in Georgetown, Kentucky. She was born in Harrison County, Kentucky to the late Clarence and Virginia Howard Roberts, on April 27, 1956. 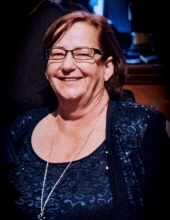 Paula was a member of Homemakers, Boy Scouts of America, loved to cook and sew, enjoyed traveling, and spending time with family, especially her granddaughter. She is also survived by several nieces and nephews, Dewayne Williams, Angela Williams, Daniel Gray, Richard Raymond, Robin Raymond, Alyssa Turner, Alexa Williams, Brookelyn Williams, Jaron Williams, Lacey Gray, and Robin Gray, and great nephew, Jayden Tucker. She is preceded in death by her son, Terry Roberts, brothers Clarence Lonnie Roberts and Danny Lee Roberts, and sister, Rosemary Jackson. Memorial visitation will be Saturday, January 5, 2019 from 2pm to 3pm at Tucker, Yocum & Wilson Funeral Home with Celebration of Life to follow at 3pm. To send flowers or a remembrance gift to the family of Paula Mary Jean Gilpin, please visit our Tribute Store. "Email Address" would like to share the life celebration of Paula Mary Jean Gilpin. Click on the "link" to go to share a favorite memory or leave a condolence message for the family.